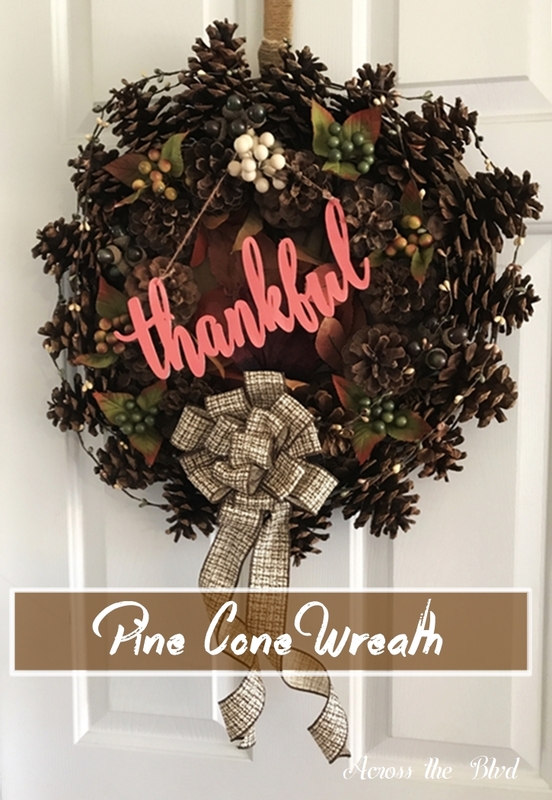 I’ve admired pine cone wreaths for a while and finally decided to take the time to make one. It was easy to put together and I only ran into one tricky part with the placement of the inner circle of cones. 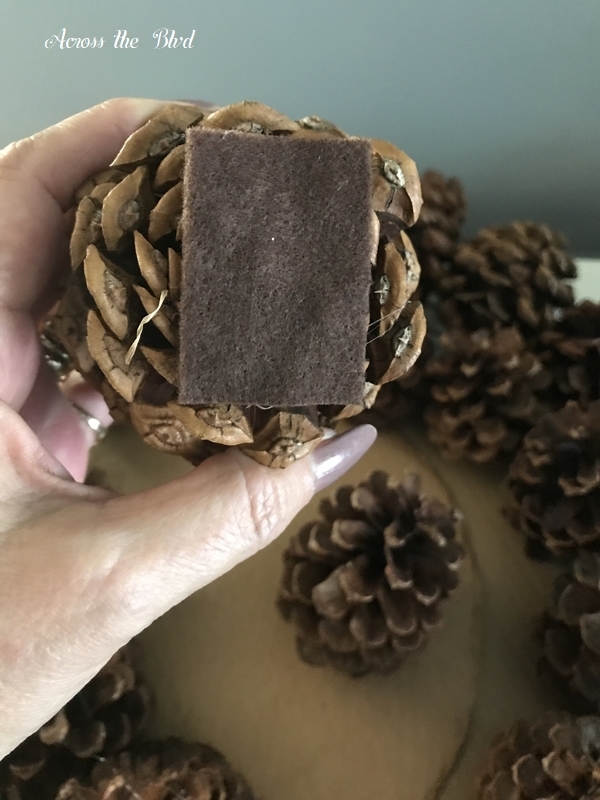 Since the low country of South Carolina doesn’t have an abundance of pine trees that drop tons of cones, I went a different route and bought 2 bags of cinnamon scented pine cones at a craft store. That did save time on cleaning them. I used most of two bags that I purchased at JoAnn’s. They were on sale, along with the stems, ribbons, and the thankful sign. I had the wreath form on hand, so the total cost for the wreath was about $10. One word of caution: Be careful with with the hot glue for this project. All of the cones are glued to the wreath and have to be positioned just so. I was not as careful as I should have been! 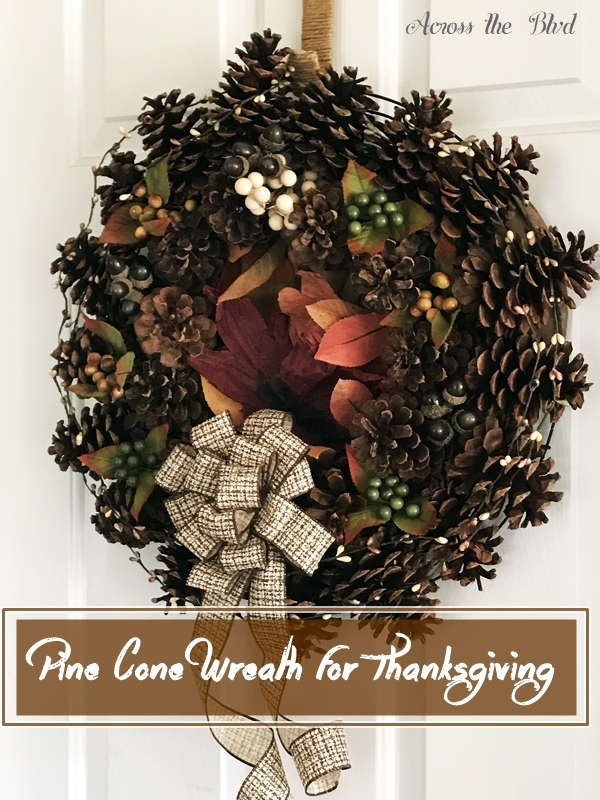 Start by adding hot glue to the wreath form and pressing the cone into the glue. It does take a little while to complete this because you’ll want to hold each cone in place for about 30 seconds. For a few of the cones, I needed to secure them with a piece of clear fishing line. 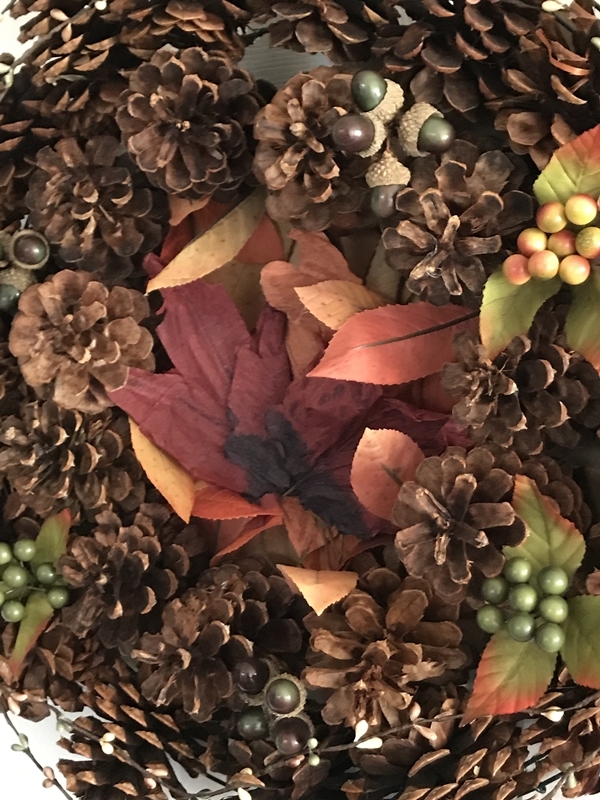 Continuing securing the pine cones around the outer side of the wreath form with the tips of the cones pointing outward. 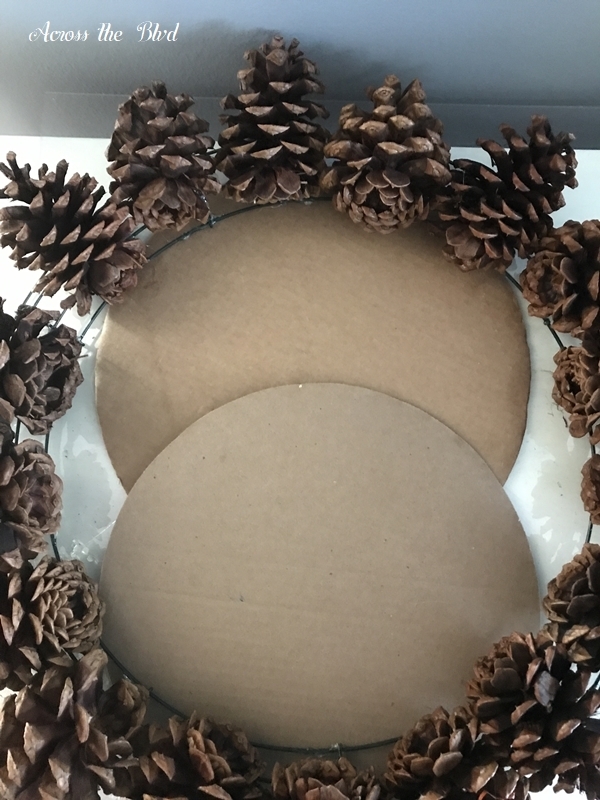 I needed something to go into the center of the wreath form and since I often toss items into my craft supply that I think I might find a use for, I found two cardboard circles that came from frozen pizzas. It would have been easier if I had one piece that fit the entire circle, but I didn’t, so I just overlapped these two. Even though they don’t fill the circle, there was enough space to glue the cones on. I glued the two circles together and then glued them to the wreath form. I tried gluing the inner circle of cones by adding glue to the bottom of them. It didn’t work. I glued a small piece of felt to the bottoms and then glued that to the cardboard. That worked much better. Complete the inner circle by adding cones around it. To cover the cardboard, I glued an assortment of leaves. I used the small berry picks and acorn picks as filler for any empty spots. A small garland is added around the cones. Some of the picks needed to be glued in place, others could be wedged in. There are quite a few ways to make a bow. The way I made this one is simple. It has several steps, but it comes together quickly. Fold the pieces in half, allowing just a little overlap. Fold the two longest strips in half and twist them into a V shape. Add one of the medium strips vertically. Add the second medium strip horizontally. Add one small strip at an angle. Add the last small strip at an opposite angle. 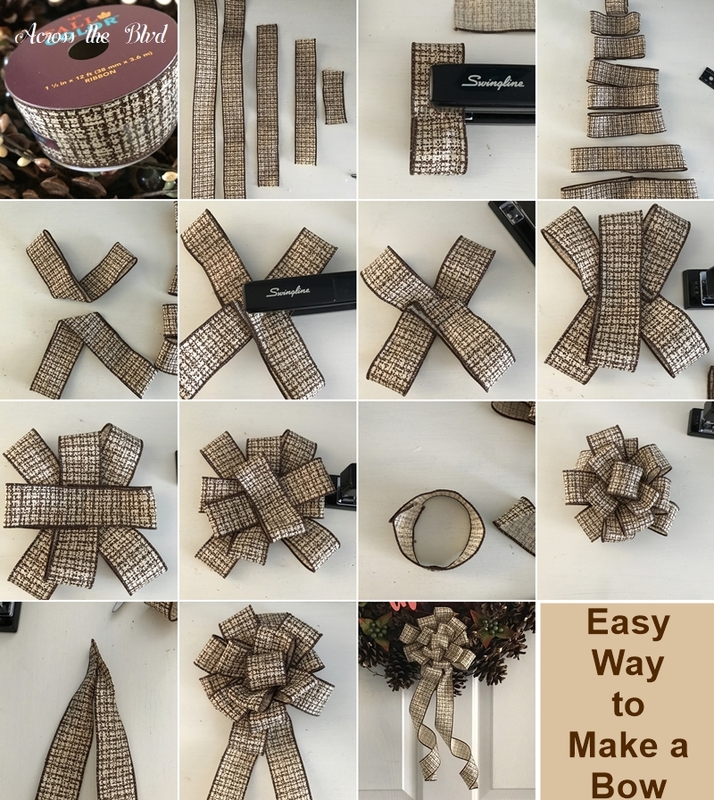 Staple the very small strip into a circle and add it to the center of the bow with a dot of glue. Fold the extra long strip in the center. Pinch the center fold and staple it together. Add it to the back of the bow with hot glue. 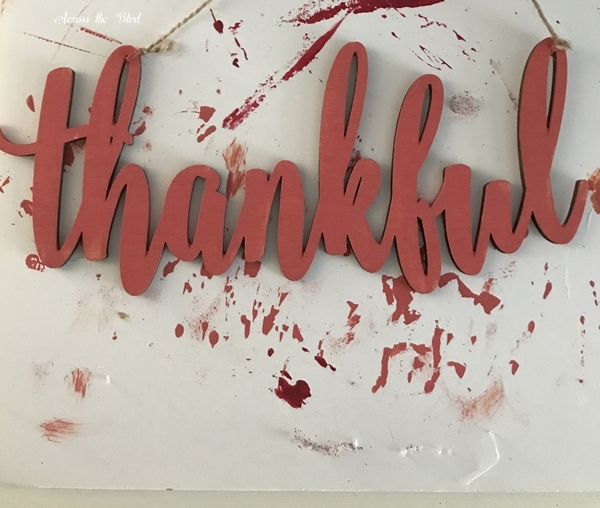 I painted the thankful sign using paint I had on hand. It’s Waverly in Rhubarb. Before adding the bow to the wreath, I took it outside and sprayed it with a coat of Krylon Clear Sealer. Hopefully this will protect the sign and the berry picks from the rain. I added a white berry pick that I found in my craft stash and looped the sign over the stem to hang at an angle. Gluing the pine cones took about 30 minutes plus the times I had to pause to run cool water over my fingers! Putting the rest of it together only took a little while longer. Now that Halloween is over, this will be hanging on our front door until it’s time for Christmas decor. This came out great. It feels perfect for the holidays. 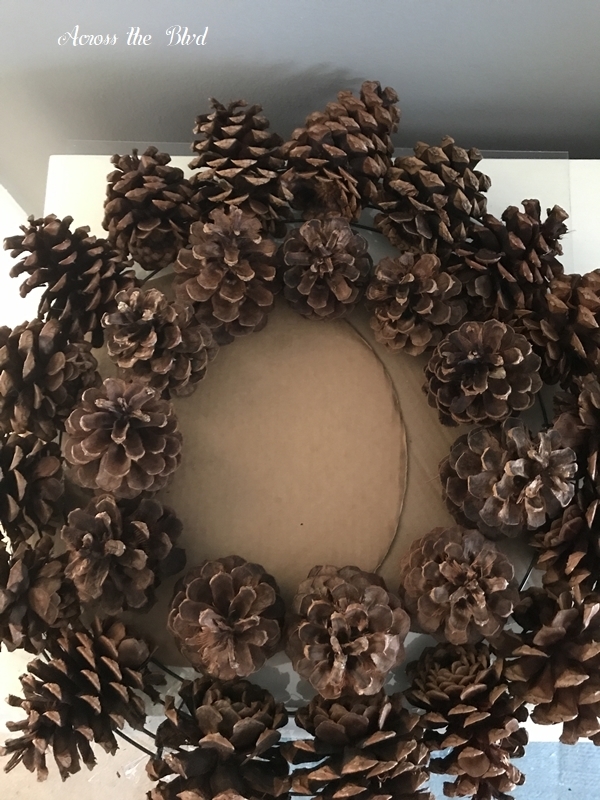 I’ve been thinking about a PINE CONE wreath. I’m feeling inspired. Thank you, Michele! I’ve been eyeing them for a while, but I didn’t want to go through the process of cleaning and baking them. Buying these was a good alternative. I’ll look forward to seeing yours! This is gorgeous! Good job, ladies. Pinned. Thank you, Donna! I appreciate the pin! Beverly this is what a wreath should look like. Full and commanding. It certainly must make a lovely presence on your front door. The pine cones are perfect. Thank you, Mary! I’m enjoying the look of the pine cones. It does have a nice presence on our front door. Very nice, love it! We have plenty of pine cones here, I need to try this. I’m surprised the cones stuck to the wreath form, Was it coated or plain metal? Thank you Beverly for linking up at the #BloggingGrandmothersLinkParty. I shared your post on Fb, G+, Pin, and Tw. Thank you, Dee. The wreath form was just a green metal form. No special coating added. Thanks for the party and for sharing! Beverly, This turned out beautifully! 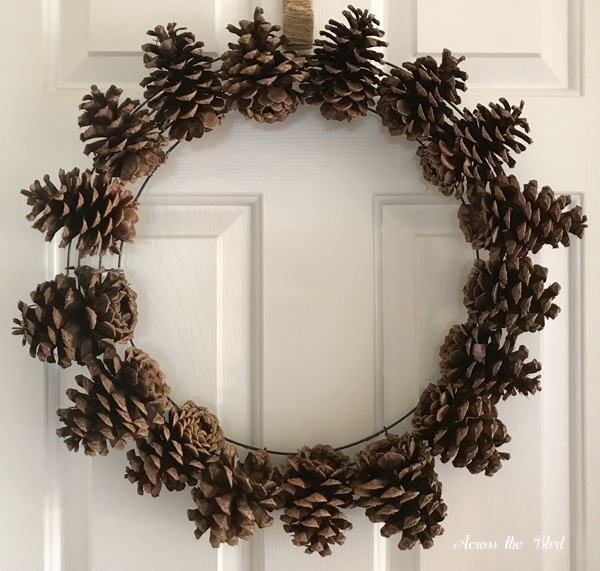 I love pine cone wreaths and have been thinking of making one, but never got around to it. Thanks for sharing how you put yours together! 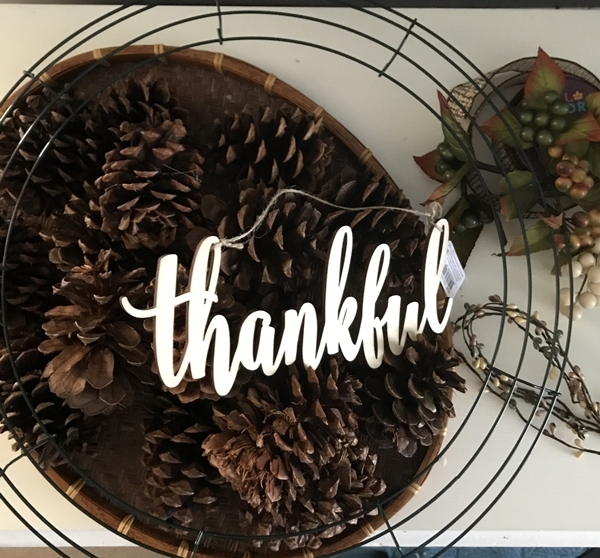 I’m sharing a Thanksgiving project this week, that uses the same font and word as your thankful sign! Pinning and sharing! Thanks, Laurie! I was happy with how it turned out. 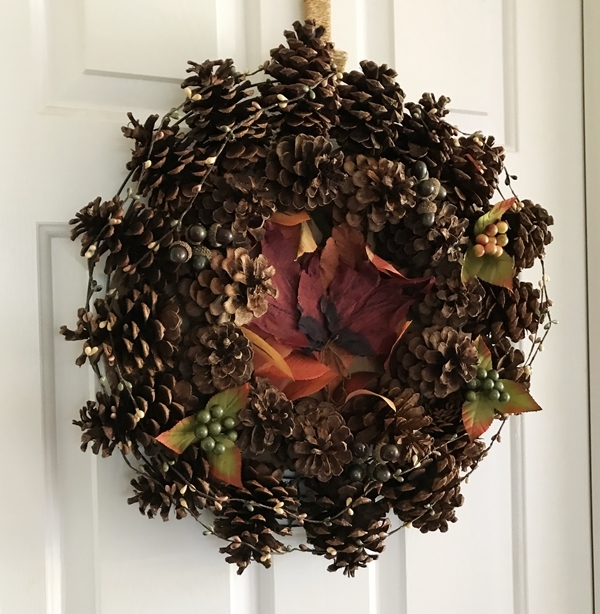 I wasn’t sure if the pine cones would adhere well to the wreath form, but with enough hot glue, it worked. I’m looking forward to seeing your Thanksgiving project. Thanks for sharing! This is really beautiful. i hope your fingers survived all those pinecones! Thank you, Trisha! I did have a few accidents! I love this wreath you made Beverly! Thanks for sharing it at C&C with J&J. Thank you, Julie and thanks for the party! Thank you, Carrie! Thanks, too for the invitation to your new party. I’ll be sure to stop by. Thank you, Christina. Thanks for hosting the party! Thanks so much, Donna. 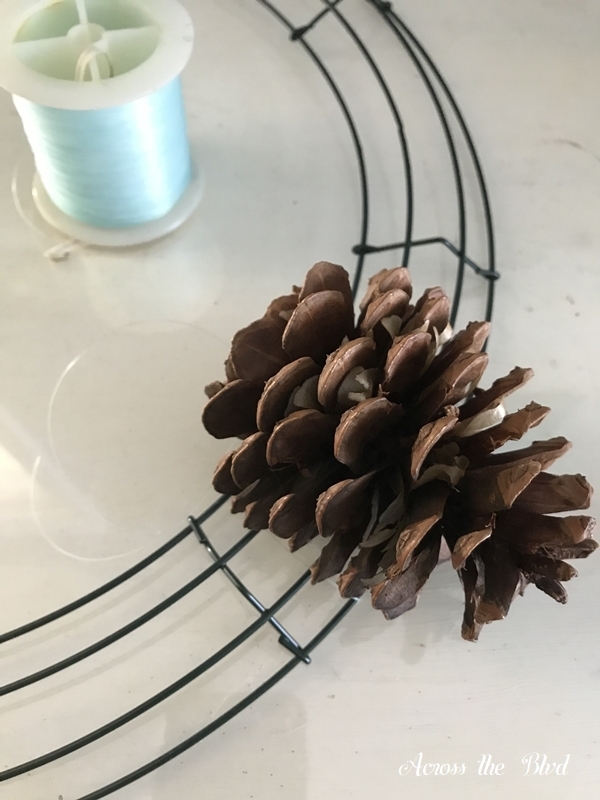 Pine cones can be a great crafting item. I’ve got a couple of ideas in mind for Christmas crafts this year. This wreath is truly beautiful. Love it! Thanks so much, Sinea. I appreciate the pin!